The Oakland Raiders starting offense struggled to get anything going in the first half in Green Bay. Despite playing the entire first half they only chalked up three points against the first and string Packers. Quarterback Derek Carr and the Oakland Raiders starters saw a significant increase in workload Thursday night at Lambeau Field, as both the team’s starting offensive and defensive units played the entire first half. Defensively, the starting unit started slow as well giving up a 14-play, 74-yard drive to the Packers to start the evening, resulting in a touchdown by Eddie Lacy. After that initial drive Green Bay was unable to put any more points on the board in the first half. The second half was a different story, as the Packers were able to get their offense rolling a little bit, and were able to put up 13 points on the Silver and Black’s defense, en route to a 20-12 win at Lambeau Field. 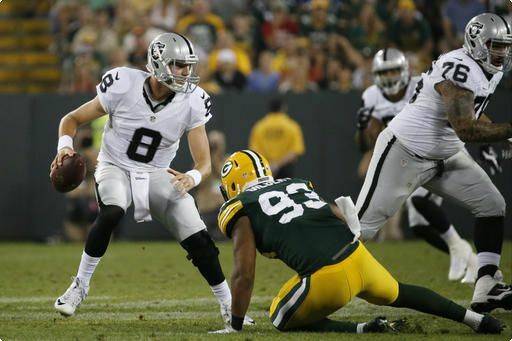 Rookie quarterback Connor Cook had a good night, finishing the game 6 of 9 for 101 yards. Highlight of the night was a blocked punt by Brendan Trawick’s. Safety Nate Allen would fall on it in the end zone to give the Raiders their first touchdown of the night with 3:01 remaining in the game. The Raiders fly back to Northern California tonight, and will be back on the practice field Saturday afternoon at their Alameda, Calif., facility. Their next preseason game will be next Saturday when they take on the Tennessee Titans at the Oakland-Alameda County Coliseum.